Setting up a home based business in India is perhaps the most prudent thing to do nowadays. Because renting premises to open a business can prove very expensive, with real estate prices in cities and towns soaring. High security deposits and exorbitant rentals are common to cities and towns. Buying your own commercial premises costs a mini fortune that can best be utilized elsewhere. Pros of home-based business: You can also circumvent licenses from municipal bodies and village administrations, if you launch a home-based business. Furthermore, legalizing a home-based business with one or two proprietors can be done Rs. 12,000 or lesser, depending upon the type of company you wish to incorporate. Additionally, you save the bother of commuting with a home-based business in India. Cons of home-based business: Unfortunately, your family’s privacy is the first major casualty of a home based business in India. Unless you have spare room, that can be used as an office. Secondly, housing societies may object to your use of residential premises for commercial purposes and prevent you from putting up a signboard to announce your business. 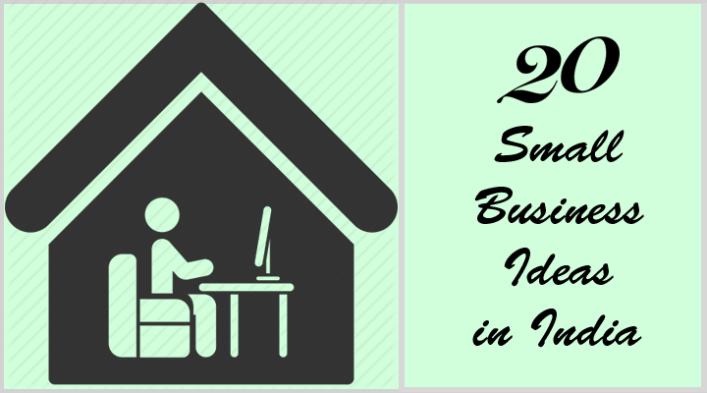 However, these need not deter you from opening a home-based business in India. A home-based business in India is well suited should you be strapped for cash and not wish to avail bank or other loans. Of course you will require adequate skills for the business you intend to enter. By any standards, network marketing, also called Multi-Level Marketing (MLM) retains the topmost position among home based business ideas in India. An increasing number of foreign companies engaged in healthcare and nutritional supplements, body, beauty and skincare are entering India. Their products are fast gaining ground as alternative therapy for a number of medical conditions ranging from poor immunity to diabetes and beauty solutions for glowing skin to hair loss prevention. With a small capital, you can become a network marketer for any of these top global brands and sell their products for a profit. Investment is fairly secure since you will spend only on stuff that is ordered by customers. All MLM companies stipulate the maximum price at which you can sell a product. However, the sale price includes a hefty profit for you. You can maximize the profit by doing this business online. A crèche or baby sitter service is a great home-based business in India you can eye. However, this business is best for a woman or a couple who have experience in handling infants and toddlers while understanding their needs. Generally, working couples in mega cities and large metros require crèche services. You should be prepared to handle kids as young as three months, since working moms will resume their jobs at the end of maternity leave. Investing in a crèche is not very high. A couple of playpens, adequate toys and games, diapers, baby food and a first aid kit is sufficient to launch you into this business. You have to provide high quality care and personalized attention to all kids you handle. Thousands of Indians have made a fortune from catering for parties and other events. You will require some great culinary and organizational skills to enter this very lucrative home business. Main task here is planning a party from beginning till the end. This means, you will have to create various menus for clients to choose from. Additionally, you also require tie-ups with foodstuff and liquor wholesalers for getting raw material and booze at lower rates. Your investment in a catering business includes buying gas and kerosene fueled stoves, large utensils, buffet servers, warming trays and related equipment. Manpower can be outsourced at short notice. The best way to go about this business is by enlisting help of housewives who can cook well and wish to make extra cash in their spare time. This business too calls for excellent culinary skills. You can prepare several ethnic foods such as meat sausages, exotic pickles, ready-to-cook spice mix, sweets, desserts and lots more. Since food is highly perishable, it is advisable you prepare small quantities, based on orders from clients. Alternatively, you can sell your products at community gatherings and through stores specializing in selling products from your native land. With cities in India witnessing an influx of migrant workers from various states, you will not encounter much difficulty in finding a market for your products. Alternatively, you can advertize your products through social media such as Facebook, Twitter and Instagram, among groups of your ethnicity. Armed with superior quality digital or film and video cameras as well as some lighting equipment such as parabolic reflectors, you can launch a photography business from home. The basic requirement for this business is an eye for pictures and high creativity. Indian tradition commands that every major event such as weddings, birthday parties and get-togethers be well preserved in the form of pictures and videos. The same holds true for corporate and social events. Understandably, the demand for photography services will be higher in mega cities and large metros. However, the trend is fast catching up in smaller towns, industrial belts, semi-urban and rural areas of India too. Commonly called ‘Tiffin,’ the meal service, this is a great home based business idea in India. Your home kitchen can easily be adapted to cook larger volumes of food for supplying clients. However, this is a labor-intensive business, meaning, you will require helpers to clean and chop the raw material, pack cooked food in appropriate containers and deliver them while hot to customers. The demand for Tiffin service comes from working people, who require fresh meals delivered to workplace or home. Depending upon your abilities, you can offer three meals a day- breakfast, lunch and dinner, on home delivery basis. Proficiency in cuisine of any particular ethnicity is great, since you can target a specific community for the ‘taste of home’. Alternatively, you can cook meals that suit a broad spectrum of palates. This is an ideal home-based business in India for those living close to commercial districts of cities and industrial belts. The work involves receiving cartons of goods from an industrial customer. You are required to check the stuff for any defects and repack flawless pieces into separate cartons. You may also have to repack cartons with assorted items as specified by your customer. Again, this business requires very little investment in the form of cartons, packaging material, labels and some manpower. Companies small and large outsource packing and repacking services from small providers to keep staffing costs low. Nowadays, it is easy to learn how to repair computers- meaning PCs and laptops. You will find cheap courses offered by institutes in every city and town. With some tools and electronic equipment required for the trade, you can embark on a business of repairing computers of individuals and companies. Some of these repairs can be done at the premises of your customer while you may have to bring home computers that need extensive servicing. A business in beadworks finds several customers. You can make beadwork jewelry or work them into fancy looking dresses. You can also make prayer beads suited for people from various faiths or make bead purses and other dress accessories. Furthermore, you have flexibility to either do beadwork yourself or hire help for making more articles. Fancy and colored beads as well as beadwork equipment including plastic thread, needles and decorative metal ornaments can be easily bought online or from stores in your neighborhood. The business requires minimal investment on raw material. On the other hand, beadwork ornaments including bracelet and necklaces, prayer beads, purses, dresses and similar stuff sell for a premium. You will require excellent creative skills to enter this business. Mining Bitcoin maybe a business you have never heard before. However, Bitcoin, the world’s largest crypto-currency, has become immensely popular among Indian investors. The Bitcoin lives in cyber-world and has no physical existence. It is bought, sold and transacted online. People who monitor the transaction process called ‘blockchain’ and bundle them into ‘blocks’ are called Bitcoin miners. Training is available at very select locations in India, such as Mumbai and Bangalore. For ‘mining’ efforts, you are paid in Bitcoin that now fetches about US$ 10,000 each. The Bitcoin you get as payment is generated by the system. This online business requires proper training and high power computers. But dividends make it worth the effort. With mental and physical stress levels in Indian cities reaching a crescendo, a great demand for Yoga and meditation classes exists. You can offer Yoga and meditation classes at your home by holding a few classes daily at timings convenient to students, housewives and working people. Your investment in a Yoga and meditation class is very marginal and includes only mats and other paraphernalia required for practicing these ancient Indian sciences. Generally, your students will bring along their own Yoga mats and other equipment. You can sell these from your home too. India is a land rife with superstition and beliefs. Millions of Indians consult ‘Vastu’ and Feng Shui experts for advice on how to decorate their new homes or offices. They also need such consultation while undergoing crises in life, which is often attributed to supernatural forces. Vastu is an ancient Indian tradition that deals with proper positioning and magnetic forces of the Earth while Feng Shui is its counterpart from China. There are no significant courses that will make you a Vastu or Feng Shui expert. However, a vast array of books on these topics are available for learners. Vastu and Feng Shui consultants can earn between Rs.1,000 to Rs.50,000 per day, depending upon your skills. Yet another great home-based business opportunity in India is to open a graphic design studio. You will require a powerful computer with an excellent graphics card and large screen. Graphic designing involves everything- from designing logos, signboards and advertisements for stores, small or big businesses to creating invitation cards. You can also design pages of books and periodicals for customers by creatively placing content with supporting images. Should you possess the required skills, you can also make graphics for newspapers and TV stations that present statistics and trends. Additionally, you can design postage stamps and submit your creations to India Post for consideration. There is no dearth of creative activity to you do with a graphic designing business. Tailoring is something anyone equipped with a good sewing machine can offer. For those who possess dress making skills, creating special garments for weddings and other occasions will fetch more income. You can tie-up with some nearby school or kindergarten to supply uniforms to their students. The simplest work in tailoring involves alteration of clothes. With the trend of buying readymade garments online witnessing an upswing, thousands of people look for tailors who can alter clothes without damaging its style and pattern. This is a great home business idea from home, if you love fashion. Whoever says that content writing requires proficiency in English language, simply does not know the business. Admittedly English content remains in great demand among companies, blogs, newspapers and websites. However, in recent years, there is also a surge in the number of organizations and blogs that require content in regional languages of India. For entrepreneurs proficient in English, Hindi and regional languages of India and having excellent grammar skills, content writing is a well paying online business from home without investment. It means, you will be researching and writing articles on themes and topics provided by your customer. You will require a computer with Internet connection to launch this home-based business in India. You will require equipment to boil caustic soda, oil and other material to create your own line of beauty and skincare soaps. The process may sound quite complex. However, rewards are worth the effort. A homemade soap that costs you about Rs.5 to make will sell for as high as Rs.50 each. Packaging your soap and marketing holds keys to your success. There are two distinct businesses for gift articles. The first one involves you making customized and handmade gifts that are generally not found in the market. These can be sold to discerning customers who look for off-the-beaten-track gifts for their loved ones, business associates, friends and others. The other business involves making customized gift packs or gift hampers. Meaning, you will buy baskets made of wicker or other material and pack them with stuff given or required by your customers. Additionally, these hampers also have to be gift wrapped. Insurance agency and insurance agent are two different professions altogether. An insurance agent generally represents a company either part-time or full-time and sells products from a specific insurer only. On the other hand, insurance agencies sell a wide range of insurance policies that cover life, medical expenses, homes and offices, automobiles, businesses and other things. An insurance agency sells products of several companies from India’s Public Sector Undertakings such as the Life Insurance Corporation of India (LIC), New India Assurance, National Insurance Co, Oriental Insurance Co as well as private firms such as HDFC Life, ICICI Prudential, Max Life and many more. Large companies and corporations have website designers in their IT team or enlist services of renowned firms offering the service. However, small businesses and individuals depend upon home-based web designers to create their website. Such small businessmen and individuals look for personalized service at reasonable prices. Under this category of home based business in India, you can offer a wide range of services. This includes taking applications for new or replacement Permanent Account Number (PAN) cards, filling online passport application forms and fixing interviews for the applicant at the local passport office, assistance in applying for Aadhaar cards by taking applicants to the nearest enrollment center, helping people renew driving licenses, procure certificates from universities and education boards and lots more. However, with a good set of skills and proper equipment, you can surely launch a home based business in India and make huge profits.